“The pen is the ambassador of the mind, its messenger, its furthest reaching tongue, and its best interpreter.”6 The most typical scribal accessory was a pen box (miqlamah, Pers. qalamdān). 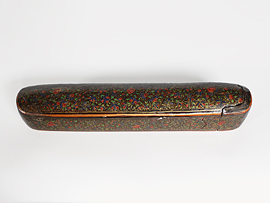 In the medieval period pen boxes were made of metal (often bronze or silver). 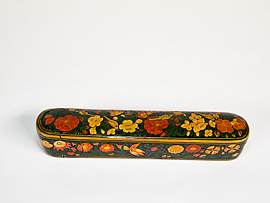 In Iran and India in the 18th and 19th centuries, these were replaced by elegantly painted lacquer. 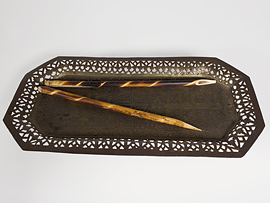 Another accessory, the inkwell (miḥbarah), usually had a silk or wool wad in the neck to prevent the pen from picking up too much ink. 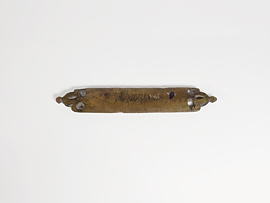 Alongside the pens inside the pen case there was usually a penknife (sikkīn) and a nibbing block (miqaṭṭah), used for trimming the point of the nib of the reed pen. 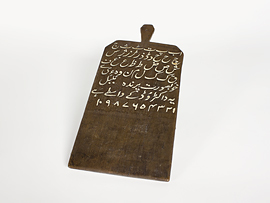 The small nibbing block was usually made of ivory or camel bone. The inks (midād, ḥibr) were either carbon-based or tannin (iron gall)-based and their quality depended on the right quantity of ingredients used. Iron-gall ink, for instance, was made by mixing pulverized gallnuts (oak apples) with vitriol (obtained from alum) and gum arabic. However, using too much vitriol had disastrous consequences for parchment and paper since the ink could burn the writing surface and destroy the text. Ink was often kept in solid form and recipes for ink-making were a well-guarded secret among scholars and scribes. For this reason, some inks are referred to as the “ink of Ibn Muqlah” (d.940), traditionally the first and greatest Muslim calligrapher, or the “ink of Abū Ḥayyān al-Tawḥīdī” (d. after 1009), famous prose writer and the author of a short treatise on penmanship. In the process of making ink, camphor or musk was often added as perfume. Aloe was used against flies and worms; myrtle water, to give the ink a greenish hue, and kohl, to give it a shiny effect. 6 Ibn Abī Dāʾūd, quoted by Ibn al-Nadīm (fl.10th century).